-How much will it cost to fix my air-conditioner? After we have examined your vehicle, we will let you know what work is needed and give you an estimate of the cost. The cost might go up while we’re doing the work if we find anything else that needs fixing – but we’ll let you know before we go ahead if it is a substantial amount. We can’t give you an estimate without seeing the vehicle, as a visual inspection is needed to determine faults. -I just want my air-conditioner re-gassed. How much will it cost? It is never a good idea to just re-gas a vehicle air-conditioning system without first finding and fixing the fault. The gas has disappeared for a reason – usually a leak. We won’t just re-gas your system without finding and fixing the fault. If you just get a re-gas without fixing any leaks, the gas will just disappear again and you will need another re-gas in the future. There could also be substantial long-term damage to your air-conditioning system. Our centres have the expertise and equipment to find and fix any leaks before re-gassing. Repairing leaks mean the gas won’t disappear into the atmosphere. It is illegal to allow air-conditioning gas (also known as refrigerant) to disappear into the atmosphere if we can prevent that. This is because air-conditioning gas is a synthetic greenhouse gas that contributes to global warming. Only unethical operators offer to ‘just do a re-gas’ without looking for and fixing any faults. 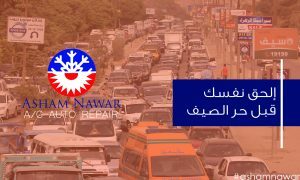 Bring your vehicle to Asham Nawar A/C Auto Repair, and you will be doing the right thing by the environment, while also getting the best advice for your air-conditioning system. We will diagnose why your vehicle has lost gas when we see your vehicle and give you an estimate. We can’t give an estimate without seeing your vehicle as other work may also be needed. -Does using vehicle air-conditioner cost money in fuel? Some people say turning off your air-conditioning saves you money on petrol. However, there are significant losses in vehicle efficiency when you drive your car at open road speeds with the windows down. Modern car air-conditioning systems are designed to be as economical as possible. A lot of consideration is given to this when manufacturers design air-conditioning systems.